Carbunculosis is a skin infection caused by staphylococcus aureus bacteria. People with compromised immune systems and specific conditions are at higher risk of developing this infection. Carbunculosis is professionally treated with a combination of surgery and antibiotics. Home remedies can help for minor infections, but they do carry some health risks. Carbunculosis is a type of skin infection that occurs when bacteria gets under the skin by entering hair follicles. As the body repairs the damage caused by a carbuncle, it may result in deep scars. This can have a significant impact on a person’s appearance, and in turn, negatively affect confidence and overall quality of life. In addition to unsightly scarring, this condition can potentially lead to severe infections that can put your health at risk. It therefore important to seek treatment for persistent carbuncles. Thankfully, there are a number of effective treatment options available to safely treat carbuncles with minimal scarring. Read on to learn about the causes and risk factors of carbunculosis, and what you can do to treat this common bacterial infection. A carbuncle is a type of skin infection whereby a group of shallow abscesses develop very closely together. As these abscesses expand, they join beneath the surface of the skin to form a large, singular mass that may measure up to four inches in diameter. If left unchecked, this can lead to a life-threatening infection that may damage blood, organs, and bones. Carbuncles can form on any part of your body, but they are most likely to develop on the back, thighs, and around the nape of the neck. Depending on the severity of the infection, carbunculosis may cause a variety of symptoms, including fatigue, pain, fever, and chills. Men are more likely to develop carbuncles than women, particularly those with health conditions that affect their immune systems. Some carbuncles heal on their own without any medical intervention—the body recognizes the presence of infection, opens the carbuncle, and drains the fluid and dead tissue. Although the skin will slowly heal itself over the next few weeks, it may leave a permanent, deep scar. Professional medical treatment may be required when the carbuncle is so deep that it cannot drain the fluid on its own. 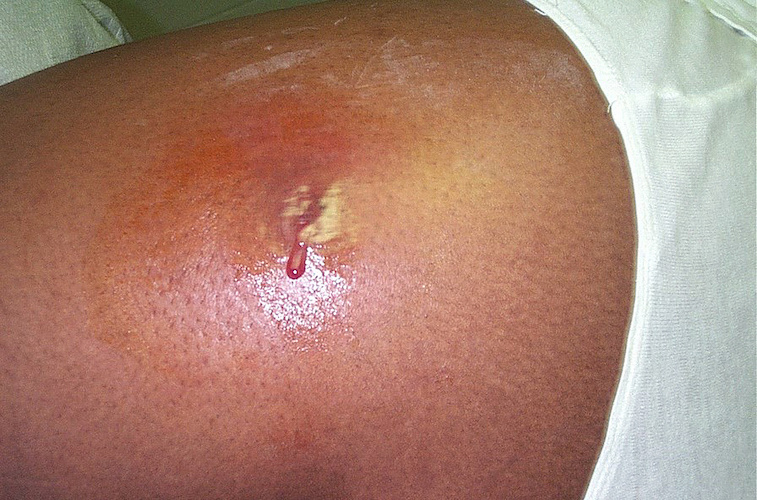 Carbunculosis is typically caused by S. aureus bacteria found on the skin. In normal circumstances your immune system protects you against this bacteria—but this isn’t always the case. Contact with carbunculosis — Carbuncles are contagious and can spread via skin-to-skin contact or the sharing of personal items. Poor hygiene — Harmful bacteria thrive in such environments. Medicines — Some medication—including steroidal drugs and medicines used in the treatment of cancer—can weaken the immune system. Skin conditions — Eczema, psoriasis, and other skin conditions damage the skin’s protective layer, and increase the risk of bacteria entering the body. Immune system disorders — Diabetes, cancer, HIV, and other conditions that weaken the body’s ability to combat infections and diseases can make one more susceptible to carbuncles. Most preventative methods revolve around maintaining good hygiene practices and common sense to keep your body fit, healthy, and ready to fight off bacterial infections. Practice good hygiene — Washing your hands regularly with hot water and soap is one of the most effective ways of preventing infection. Promote immune system health — Eat nutritious food and regularly engage in physical activity to help strengthen your immune system and improve your body’s ability to ward off infection. Treat wounds properly — If you sustain a cut or abrasion, be sure to keep it clean and fully covered with a sterile bandage until your skin has healed. Avoid contact — Do not touch or share personal items with someone who has a carbuncle. Surgical treatment is a good option for anyone who has a persistent carbuncle. If you develop a carbuncle that does not drain within two weeks of its formation, you should see a healthcare provider to ensure the infection does not spread. You should also consider getting medical treatment if the carbuncle is located on your face as there is a risk—particularly with larger carbuncles—that it will leave a scar. Treatment comprises incision and drainage of the carbuncle. Surgical drainage, when used in conjunction with antibiotics, can do wonders for limiting scarring. Understanding the risks involved with this infection and taking a proactive approach to treatment can help you keep your skin looking and feeling beautiful. In most cases, your healthcare provider will be able to diagnose carbunculosis with a simple visual assessment. They may also require a blood or urine sample to positively confirm the type of bacteria responsible. After identifying the presence of carbunculosis, your doctor will schedule a time for treatment. As Dr. Anna Karp, dermatologist at the Skin Institute of New York explains, on the day of treatment your doctor will numb the affected skin and make a small incision in the tip of the abscess in order to drain the carbuncle. If you have a particularly deep infection that cannot be completely drained, your doctor may use gauze to absorb any residual fluid. “This is followed with a course of topical and sometimes oral antibiotics, depending on how bad the infection is,” says Dr. Karp. The exact antibiotics you will be prescribed depends on your symptoms, the severity of your infection, and additional factors. Your doctor may also recommend over-the-counter drugs to aid the recovery process and to help manage some of your symptoms. Acetaminophen, for example, is commonly used to treat the discomfort and fever associated with carbunculosis, while nonsteroidal anti-inflammatory drugs such as ibuprofen can be used to reduce swelling and pain. Be sure to talk to your healthcare provider for more information about whether these drugs are right for you. For relatively minor carbuncles, DIY home remedies can be used to help the body treat the infection. According to Dr. Karp, the most effective method involves using a warm compress to help the fluid drain out. Carbunculosis is a serious skin condition that can affect much more than the appearance of your skin. Having a good understanding of the causes and risk factors can help you make an informed decision when it comes time to treat your infection.